I recently did a fresh install of 10.8. Prior to this install, I could rapidly tap twice on my touchpad and, on the second tap, drag the pointer to highlight text. Now, with this new install, that feature is missing. I tried looking in the trackpad settings but couldn't find anything to re-enable this feature. Click the check box that says "Dragging" and you should be all set. For more details see this CNET article. 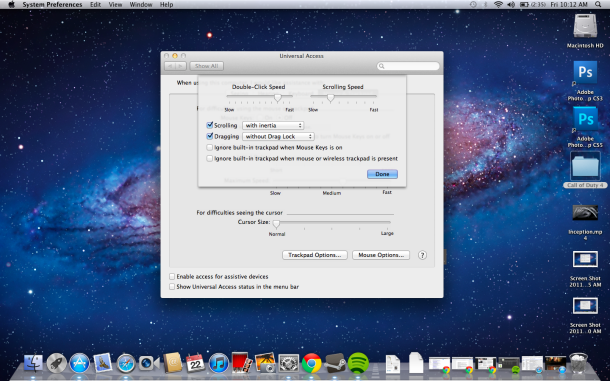 By the way, the exact method to perform this action has changed slightly with Mountain Lion. This way you can highlight text without delay by using three finger touch. If you need to highlight lots of text, you can release one of the three fingers and continue to move the cursor down with that finger. Not the answer you're looking for? Browse other questions tagged mountain-lion mouse trackpad . How can I enable Trackpad tap-to-click for the login window in OS X 10.8?